Hibbard,Spencer,Bartlett & Co catalog, 1899. Hibbard,Spencer,Bartlett & Co catalog, 1917. The Geo.Worthington Co. catalog, 1902-1904. 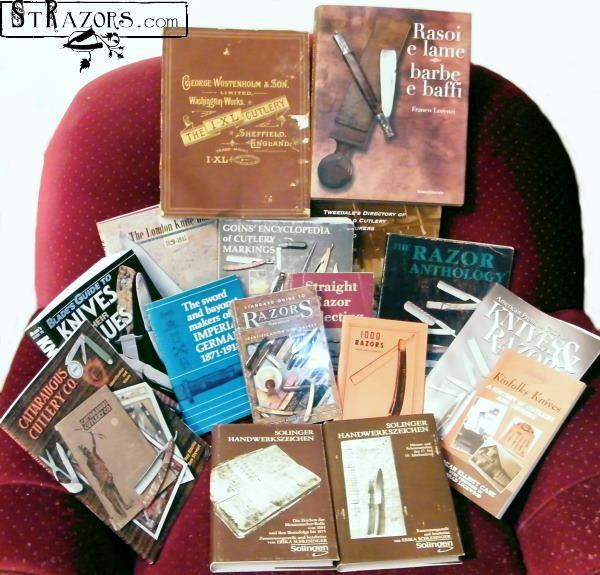 Soviet Russian catalog of "Trud" razors. Simmons Hardware Co. history from catalog 1912. Simmons Hardware Co. catalog, 1939. Honeyman Hardware Company catalog with H.Boker & Co. razors, 1909. J.A. Henckels catalog, 1 October, 1933. Gray & Dudley Hardware Co. catalog, 1905. Erik Anton Berg catalog, 1896. Henry T. Lummus articles: "Old Sheffield Razors", December 1922 and "More Old Razors", May 1927. How to define a handle material. Dating the razors, before and after 1891. П.М. Шлемович, Ремонт Опасных Парикмахерских Бритв, 1965. ...Как бритва А.Б. Герчиков 1982 №11, ноябрь стр. 87. A. Feist & Co. Lunawerk, Solingen. Wilson, Hawksworth, Ellison & Company; Kayser, Ellison & Co.
Why diamond pastes have conflicting grit sizes. Information from Mr. Stremmel, the managing director of DOVO, 2008. 'Honing Razors and Nihonkamisori' by Kousuke Iwasaki, 1963. Translation by Jim Rion (aka JimR on SRP). The article was kindly provided by Jim Rion (www.easternsmooth.com). Henry Godfrey Lamb Long, Sheffield. Charles Cammell & Co., Cyclops Works, Sheffield. The history of Frederick Reynolds Ltd. The history of the George Butler & Co. The history of Thomas Turner "Everlasting". The history of Carl Victor Heljestrand, Eskilstuna, Sweden. The history of Gebrüder Weyersberg, Solingen-Ohligs. The history of Joseph Elliot & Sons (Sheffield) Ltd. Pages with razors from Camille Pagé books. (Camille Pagé (1844-1917) - cutler and encyclopaedist, who made a great work. He collected since 1896 to 1904 all info about profession in six volumes). The history of William Rodgers, Sheffield. The history of Thomas Tillotson & Company, Sheffield. The history of William Hargreaves & Co. and Hargreaves, Smith & Co. The history of Joseph Smith & Sons, Sheffield. Several notes and facts from the history of Savigny & Co., London. The history of F. Koeller & Companie, Solingen-Ohligs. The history of Samuel Smith, Sheffield. The history of William & Samuel Horrabin, Sheffield. The history of Foster and Bailey, F&B, Providence, Rhode Island. The history of Abraham Leon, Sheffield. Document about the "wash-stamp" practice on cutlery, mainly knives and razors. "Tariff hearings before the Committee on ways and means of the House of Representatives Sixtieth Congress. 1908". The history of Gilbert Brothers, Sheffield. H.Boker & Co. Inc., 9TE5 trademark. The history of Edward Barnes & Sons, Sheffield. 'Thuringian water whetstones from the J.G. Escher company in Germany.' by Peter Buhlmann „hatzicho“, Germany, October 2013. The Tang Stamps Of Adolph Kastor, Camillus and Their Cutlery Relatives. Заточка и правка опасной бритвы. История известной английской компании George Wostenholm and Sons. История американского рынка опасных/прямых бритв. История одной из известнейших немецких компаний H.Boker & Co.
Советы по бритью опасной бритвой. Идентификация, определение примерного возраста опасной/прямой бритвы. Identification, definition of the approximate age of the straight razor. Материалы, используемые для изготовления ручек для бритв. The materials, which are used for manufacturing of handles for razors.